Over the past ten years, Johnny Jewel has established himself as the master of a very particular corner of contemporary electronic music in the United States. From his leadership of taste-making acts like Chromatics, Glass Candy and Desire to the curation of his own label Italians Do It Better, there is a soft-focused, hazy, indiscriminately nostalgic tone to his Italo Disco. Whether by design or not, it happens to tessellate perfectly with current trends in American independent cinema, to such an extent that it has become nigh-on impossible to listen to Jewel and not start syncing the music to an imagined movie scene in one’s mind. How confusing, then, that his new record should be titled ‘Themes for Television’ but actually feature no music that was created specifically to score any visual medium. To explain, the record is comprised of outtakes from the sessions for Jewel’s 2017 album ‘Windswept’. Eager readers will be aware that tracks from the latter were selected for use in David Lynch and Mark Frost’s Twin Peaks: The Return, ultimately leading to Jewel and Chromatics appearing at the climax of the premiere of the show, but even then Jewel was never enlisted to write specifically for it. This title is therefore a tacit nod and a wink to his music’s widespread reputation, an entreaty for listeners to let their imaginations run wild, permission from the man himself to perceive this music in the way that most of us already do. What we have here is 21 tracks that run just shy of an hour, snatches of ideas that do not necessarily have the temporal space to fully stretch their limbs, their respective scenes often ending prematurely, the narrative drive meaning the album has no choice but to move on. If the aim is to play on his stereotype as a dream soundtrack composer, then this is a disjointed show he’s been lumbered with. Moments of serenity and quiet majesty are there, in the minimal reworking of ‘Windswept’ or the suspended animation of ‘Déjà Vu’, but they are agonising glimpses of what Jewel excels at, rather than the full cinematographic image. The two tracks that Chromatics performed on Twin Peaks, ‘Shadow’ and ‘Saturday’, are included, relative high spots of glistening reflection and speckled memories that recall Jewel’s most celebrated work on the much-loved Drive soundtrack. It amounts to a strong opening third – or first act, if you will – but the attention-worthiness sags just when the stakes should be pulling us into the drama. ‘Embers’ and ‘Sleepless’ are symptomatic of the drifting later stages of Themes for Television: gone are any legitimate comparisons to John Carpenter or Angelo Badalamenti, replaced with a sense that we are in the outer reaches of what was an outtakes album to begin with. Jewel deserves still to be considered in high regard for his continuing reign as the commander-in-chief of wistful, reminiscent electronic music, and one suspects he will continue to be approached by producers looking for that magic spell he can cast over a moving image. 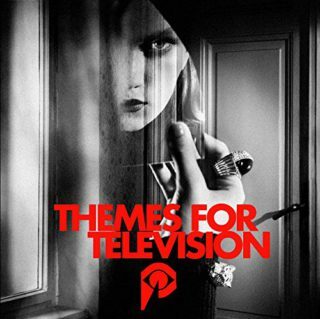 But ‘Themes for Television’ is a release for the die-hards, its moments of wonder fighting for attention against a wave of sadly forgettable tracks. Perhaps an imaginary short film would have been the perfect concept for this set of session leftovers.